The 2004 Calgary Civic Arts Policy led to the formation of Calgary Arts Development, an organization that promotes and directs investments in the arts to increase the sector’s public and artistic impact. The Calgary Civic Arts Policy also directed this arm’s length authority to create an arts development strategy for Calgary. When our city was designated a Cultural Capital of Canada in 2012, the time had come to take action. 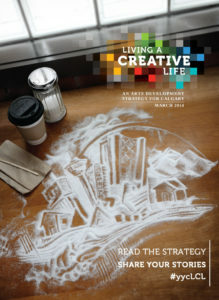 Winning the Cultural Capital bid involved a renewed commitment to developing a long-term strategy for the arts in Calgary, and Calgary Arts Development began to lead the Arts Plan process that has now become Living a Creative Life. Engaging a wide group of stakeholders, the Arts Plan process took place from April 2012 to December 2013 and involved consultations with Calgarians who ranged from interested citizens, community groups, educators, and civic and provincial partners, to arts administrators from organizations of all sizes, and independent artists of all disciplines. Overarching vision: Calgary is a place that empowers every resident to live a creative life, fuelling a vital, prosperous and connected city. Mission: To align and activate Calgarians in creating a vital, prosperous and connected city through the arts. Creative Communities: Calgary’s communities enjoy access to a rich spectrum of arts experiences. Centre City Arts District: Calgary’s Centre City radiates creative energy from the core out, making it a destination for Calgarians and visitors alike. Arts Incubation: Calgary strongly attracts artistic talent to live, work and achieve artistic excellence. Artistic Exchange: Calgary is regarded as a world-class city because its artists, arts organizations and presenters import and export the highest quality of work on regional, national and international markets. Youth & Education: Calgary’s youth become highly engaged and innovative citizens as they connect with their communities through the arts. Each of these focus areas is supported by detailed outcomes, drivers and tactics, as well as indicators by which success will be tracked and progress measured. Tactics, the tangible actions that will support positive change in each focus area, are not listed in the publication. Rather, they will be detailed in separate tactical documents for each focus area, serving as a roadmap for those who have agreed to help effect change in that area. Tactical plans are an integral part of Living a Creative Life and will always be included when discussing this strategy. A strategy of this scope requires broad and unprecedented collaboration, with stakeholders from different sectors committing to the vision and goals of Living a Creative Life. The strategy already has many signatories, i.e., groups or organizations that have agreed to contribute to Living a Creative Life and consider the strategy’s overall vision and focus areas during their own strategic planning. Signatories will also participate in shared measurement activities so that progress towards the strategy’s goals can be tracked. As the facilitator of the Arts Plan process and a signatory to Living a Creative Life, Calgary Arts Development has a role to play in some areas, and in others will support the leadership activities of signatories. This strategy outlines shared visions, and so the work—and the results—will likewise be shared with all Calgarians.